So many secrets, so little time. Garak (Andrew J. Robinson) the Cardassian-in-exile/enigma on DS9 and (sort of) friend of Bashir, starts having medical issues. He enlists Quark to get a piece of technology and sets off alarms when Bashir and Odo learn the item is classified by the notorious Obsidian Order, the “all-seeing eyes and ears” of the Cardassian Empire. Garak tells Bashir that the piece of equipment is a brain implant installed to help him get through torture in his past life as an agent of the Obsidian Order. He’s used it continuously for two years — to cope with his exile — and it’s breaking down. Bashir helps Garak through the withdrawal (and hears varying accounts of why he’s in exile) and eventually heads to see Garak’s old Obsidian Order boss Enabaran Tain (Paul Dooley). Tain helps Bashir because he wants Garak to live out his life in miserable exile on DS9. 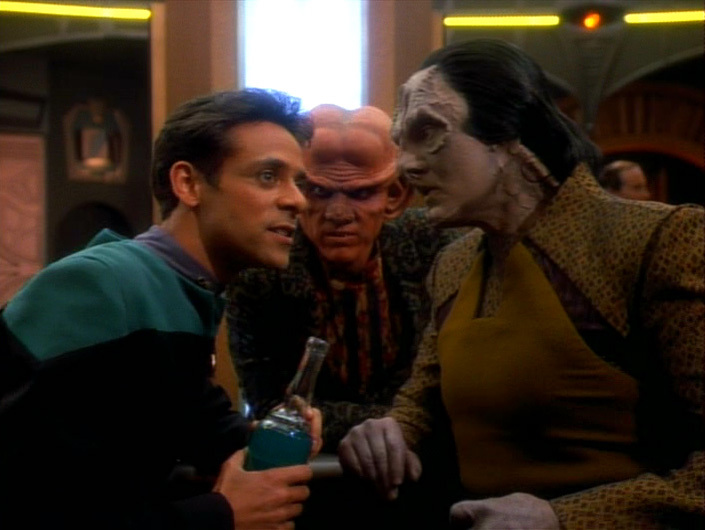 A recovered Garak, of course, casts doubts on most of what Bashir learned about him during the experience. But Garak’s shadiness is all the shadier afterward. This episode isn’t the first time we meet Garak (that was back in “Past Prologue” in the first season). But this cements him as a power player and a key recurring character on DS9. Garak is part of some of DS9’s biggest events over the years, and Robinson was one of DS9’s best actors. The episode is also hugely important as it introduces the Obsidian Order and Tain. We see Tain again in DS9’s third season and again in the fifth, and his involvement in Alpha Quadrant dealings with the Dominion is hugely significant. More on that in future reviews. One other small point. This is a nice episode in further establishing Odo’s credentials as someone who’s seriously plugged into events and information in the Alpha Quadrant (with a special emphasis on Cardassia). The episode suffers from trying to get some of the regular cast involved where they’re not really needed. The scenes with Sisko, Dax and Kira are just completely superfluous, and the scene with O’Brien isn’t much better. Beyond that, Bashir’s interest in Garak’s problem early in the episode isn’t handled that well. 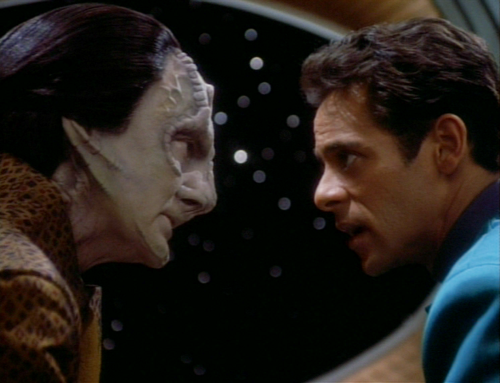 Bashir became one of DS9’s stronger characters — and the transition was starting in season two. But you can still see some of the annoying qualities that made eyes roll in the first season and half of the second. Last point — and this is kind of minor — DS9 often tried to make foreign spy agencies/governments appear more ominous than they could have possibly been. Tain knowing so much about Bashir was just hard to swallow. The implication is that DS9 is filled with spies taking note of minor information all the time. This isn’t a great episode, but it’s a good one that puts some key things in place going forward. 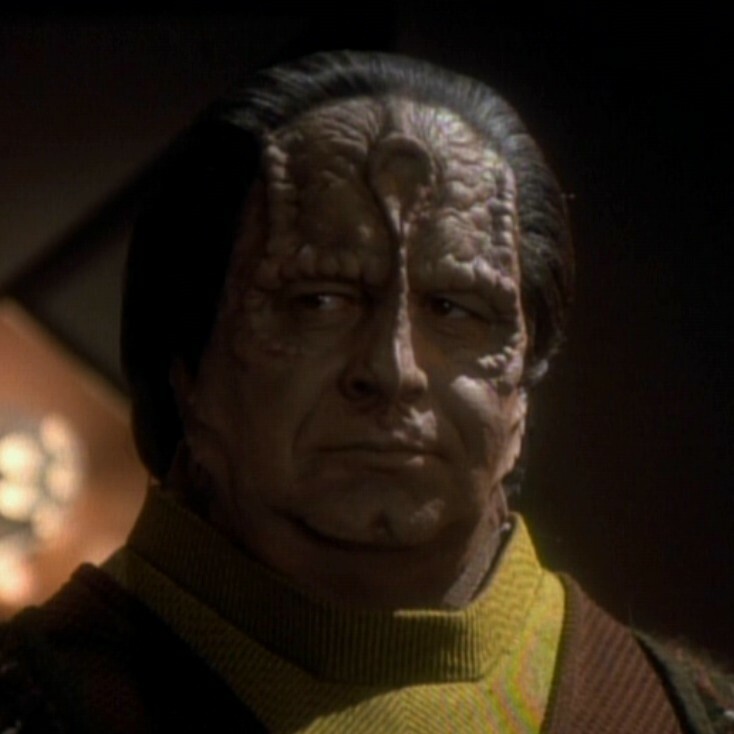 While we don’t learn here — and never fully learn — why Garak is in exile in the first place, we learn that he was a spy and a key operative in one of Cardassia’s most notorious organizations. That makes his “man of many talents” schtick work, to say nothing of his general cageyness. Garak and Tain (though he shows up only a few times) were really great supporting characters on a series that would go on to be filled with great supporting characters. As mentioned in our last review, DS9 starts to get its footing in the final third of the second season because it puts so much in place for what we would see later. This episode is a huge domino. We return to the mirror universe in one of DS9’s classic episodes.